This is the lens mount for mounting individual lenses on D5500 and ProLab II 4x5 enlargers. It is installed in place of the 3-lens turret. 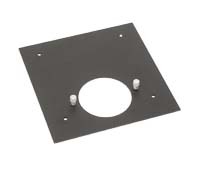 Supplied with lens plate securing screws. The appropriate lens plate is required to attach the lens to this lens mount. For lens plate recommendations for specific enlarging lenses, please refer to our D5500 / ProLab II Lens Mount Reference Chart. These lens mounts are used and may have minor cosmetic marks from previous use, but are certified to be in perfect working condition.